A North Carolina history teacher is facing a firestorm of controversy after he allegedly stomped on a U.S. flag inside a public school classroom. The incident happened Monday at Massey Hill Classical high School in Fayetteville – home to Fort Bragg and one of the most patriotic communities in the nation. Click here to join Todd’s American Dispatch: a free must-read for Conservatives! A spokesperson for Cumberland County Superintendent Frank Till Jr. told me they are investigating the allegations and will not comment until the probe is completed. “Clearly there are other ways to teach First Amendment rights without desecrating a flag,” the superintendent said in a statement to television station WRAL. The Fayetteville Observer identified the teacher as Lee Francis. 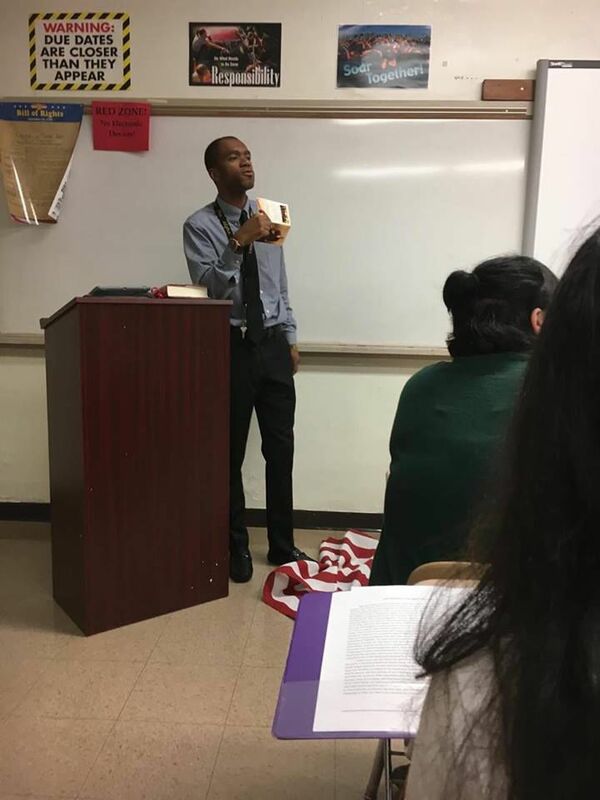 A Facebook user identified as Sara Taylor posted a photo online that showed Francis at a lectern with the American flag crumpled on the floor. “That flag might not mean anything to that teacher, but it means a lot to us and it means a lot to the family’s (sic) who had their service member come home to them in a casket with that flag draped over it,” Taylor wrote. WRAL quoted students as saying the teacher tried to burn and cut the flag before dropping it on the floor. They also report that at least two students walked out of the classroom during the demonstration. An active duty Army officer who has children in the Cumberland County school system told me not only was the teacher disrespectful but also a bully. The fact is that many children of our brave fighting men and women attend that school and they deserve better. I was especially moved by the patriotism of the teenagers in that classroom. Ms. Taylor wrote on her post that one of the students took the flag out of the classroom and asked that it be properly take care of. God bless those young people.